Medium - £48.99 Only 3 left! X-Large - £48.99 Only 2 left! Are you ready to be the fearless leader of Blue Team and command your soldiers in battle against the Flood-infected armies and the remaining forces of the Covenant? Or maybe today's a nice light day of training and you just get to lead your team in a battle simulation against Red Team. Either way, you'll want to make sure you're fully prepared to direct you're fellow Spartan Soldiers to victory. First things first, you'll need to look like a Commander that no one would even think to second guess. 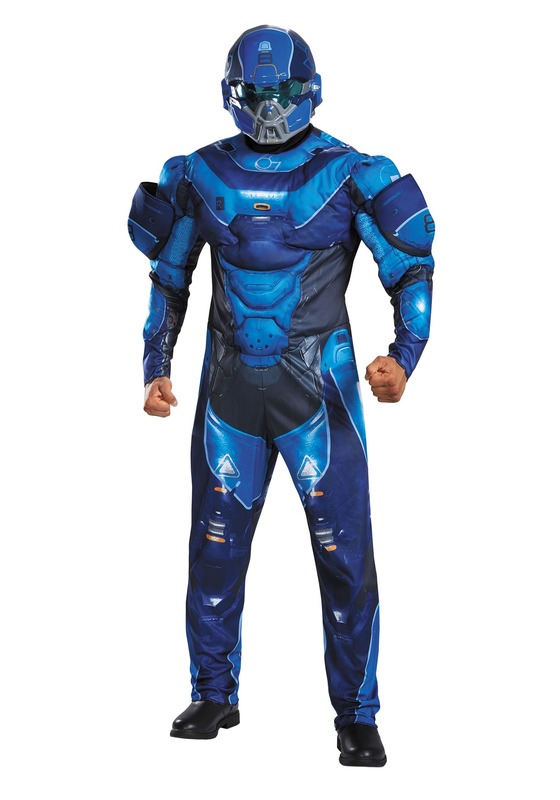 So grab this Blue Spartan Muscle Chest Costume and none of the soldiers in your troop would question your commands. You'll look like one of the few soldiers who survived Reach's biological augmentation procedures and became a super-solider to save the world during the Human-Covenant War. With this Mjolnir Armor Costume, you'll almost feel as if your strength, speed, agility, and reflexes are all amplified to the fullest! However don't be fooled by how realistic this costume looks, sadly we still don't have the technology to fit the type of artificial intelligence normally used in a starship into a battle ready suit of armor just yet. Although, once everybody sees how amazing one could look in a Spartan's Mjolnir Armor, there will be no doubt as to the direction in which earth's scientists and engineers should be aiming their work towards. So help lead Blue Team to victory in some epic live action role play or take the party by storm this Halloween and show everyone just how fashionable a Commander in the UNSC can be. Whether you shift the direction of a battle or the direction of technological advancements, you can be sure that you'll look good in this Blue Spartan Costume.